First-class mail is used for postcards, letters, large envelopes, and small packages. First-class mail must weigh 13 ounces or less. Pieces over 13 ounces can be sent as Priority Mail. USPS first-class delivery is given priority over standard mail, and local mail will typically be delivered in 2-3 days. Nationally, first-class mail should be delivered in about 4 days. First-class mail postage includes forwarding and return services with no additional charge. If you have 500 or more mail pieces, you can choose to presort your mail. Presorted mail costs the USPS less money to process and deliver, resulting in an approximately 20 percent lower postage rate. Standard delivery time is the same as first-class mail. To receive the lower postage rate, the addresses must be grouped by zip code, and be NCOA updated and CASS certified. Standard Mail usually consists of flyers, circulars, advertising, newsletters, bulletins, catalogs, or other printed pieces that are generally identical in content. Standard mail must be less than 16 ounces and must meet a minimum quantity of 200 pieces or 50 pounds of mail. Standard Mail, also known as "bulk mail", is processed by the USPS on a “time available” basis. Standard mail is not forwarded or returned if undeliverable unless a special endorsement is used. Standard mail will typically be delivered in under 5 business days locally, but nationwide it could take 2 to 3 weeks. Standard Mail should not be used for time-sensitive mail. As with Presorted First-class, to receive the lower postage rate, the addresses must be NCOA updated, CASS certified, and put into presort order. Standard Mail is the least expensive postage mode, approximately 32 percent less than the price of first class. Standard mail postage rates apply to mail up to 3.3 ounces. Mail heavier than 3.3 ounces will have a small weight surcharge. Nonprofit Standard Mail postage is lower than regular prices (up to 70 percent less than first-class mail), but not everyone can qualify. Nonprofit is a favored postage rate within Standard Mail, and is processed in the same way. Organizations wishing to mail at nonprofit Standard Mail prices first must be authorized by the Postal Service as eligible. Get a copy of Form 3624, Application to Mail at Nonprofit Standard Mail Prices. This form is also available from your postmaster or your business mail entry unit. 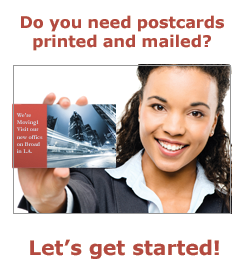 Let Castle Press handle all of your mailing needs!